In her editor’s afterword, Valentinelli aptly compares reading the anthology to “meandering into a haunted mansion,” each story a new thrill, a new corpse or growing puddle of blood. Monica Valentinelli is a writer and game designer who has worked with Eden Studios, Abstract Nova Entertainment, and White Wolf Publishing, among others. She’s written non-fiction for Apex Magazine and Green Ronin Publishing. She writes regular columns for Geek’s Dream Girl and the How to Write Shop. Her fiction ranges from short stories to novellas. Publications have appeared (or will appear) in Tales of the Seven Dogs, White Wolf Quarterly, Buried Tales of Pinebox, Texas, Daily Bites of Flesh: 365 Days of Flash Fiction, The Zombie Feed, Vol. 1, Apexology: Science Fiction and Fantasy, and New Hero Anthology (forthcoming). Valentinelli’s e-book, The Queen of Crows, is available from DriveThruFiction.com now. This winter and fall, respectively, Valentinelli edited Slices of Fate: The Collected Works of Eddy Webb and Haunted: 11 Tales of Ghostly Horror, both from FR Press. Below, Valentinelli and I talk about editing, ghosts, and what scares her most. What do you enjoy about editing? I like to edit from time to time because it forces me to exercise a different part of my brain than I normally would. When I’m writing, I’m down in the trenches trying to meet a set of guidelines or my own expectations for what that story or game should be. When I’m editing, the opposite is the case. Editing reinforces my ability to empathize with people who edit all day, all the time. It’s not easy to comment on someone else’s work. What sort of editor are you–hands on, hands off, something else all together? It depends on the project and how it’s set up from the beginning. Some projects require me to be hands on if there are time constraints or strict guidelines that have to be followed. Other times? The onus is on the writer to fit whatever guidelines are on the page. If at all possible, I would prefer to be hands off because I’d rather be a cheerleader than an ogre. On the page or screen, what sort of ghost story scares you the most? In recent memory, the scariest ghost stories are the fatalistic tales where there is no chance to “save” the ghost and send them on or the more open-ended constructs where that experience can never end. There are some fantastic films from the Far East that highlight the non-redemptive ghost. Ju-On, Kairo, Dark Water. 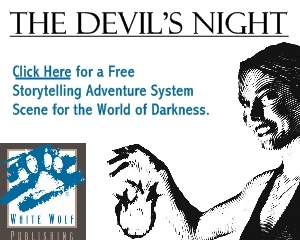 Most of these have been remade for an American audience and they still hold their appeal for me because the stories are more focused on dealing with the horror than rescuing a spirit. I’ve had many strange experiences in my life that I can’t rationally explain. This helps me sleep at night because it means there’s another mystery left to explore. My world holds much wonder in it. Is it possible that ghosts exist? Yes. After all, energy cannot be created or destroyed. Am I certain without a cliché shadow of a doubt? No. How did Haunted come about? Haunted: 11 Tales of Ghostly Horror was the brainchild of the publisher Matt M. McElroy. He wanted to do an anthology that was more focused on the people hunting ghosts than the monsters themselves. Was it open submission or by invitation? Matt decided to do an invitation only for the anthology because he had a select group of authors in mind he knew would do a fantastic job. What strategy did you use to organize the stories? I read them out loud and balanced them based on theme, literary structure, and setting. “What’s the Frequency, Francis?” which was written by Alex Bledsoe opens the anthology because it shifts from present to the distant past and back to the present again. My goal was to keep readers turning the page and to make that happen I wanted the stories to flow from one to the other. Where the story took place was just as important as how it was written. For example, two stories, “We Need Johnny” by Chuck Wendig and “After Life” Nancy O. Green were written in a more experimental fashion. I decided to put the less-experimental story first to help transition the reader and then followed up with a story by Jason L Blair called “It Happened In The Woods At Night,” which he penned in a three-act structure. Were there any pleasant surprises in terms of connections between stories? I was surprised to see that the majority (if not all) of these stories are tried and true Americana. While there are a few tales that introduce the question of mistaken identity (e.g. Is this entity really a ghost?) the majority of the ghost’s origins are Western and all the stories take place in the continental United States. Have you ever been ghost hunting? Don’t need to. They usually find me. How did you meet Jaeson K. Jrakman? I first met Jaeson at a small convention in Milwaukee several years back where he was giving a talk on ghost hunting. As luck would have it, I sent him a lead on a case someone else had alerted me to. Jaeson is a very rational person. That’s one of the reasons why I think he’s a good representation of a serious ghost hunter who wants to prove ghosts exist using science. What’s next for you? As an editor? As a writer? As a designer? Not so much as an editor, but as a line developer — which, in my opinion, employs a very similar skillset to what an editor does. And… that hasn’t been announced yet, so never you mind there. As a writer? I’ve got a few short stories brewing and I’ll be gearing up for the release of Redwing’s Gambit, a science fiction novella for the Bulldogs! RPG. As a designer, Strange, Dead Love, a paranormal romance sourcebook for Vampire: the Requiem recently debuted and I’m also working on [redacted] for White Wolf, too. There’s always another story to tell and another setting to explore. It keeps me out of trouble! 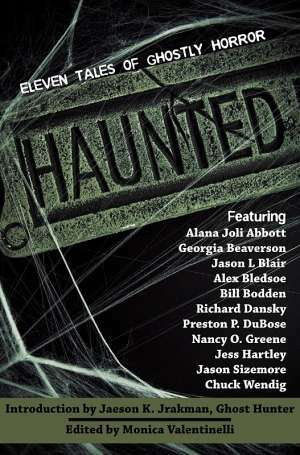 Haunted: 11 Tales of Ghostly Horror and other FR press titles are available now at DriveThruFiction.com.